The Evolve line of compressor-free, medical grade refrigerators* are quite impressive. Powered by SilverCore™ Technology, they have no compressor. And because they have no compressor, they have no mechanical parts, run quiet, use less electricity, and generate less heat. The system “absorbs heat energy from the storage cabinet using a non-toxic, non-hazardous refrigerant embedded in the walls. Heat energy is channeled up to a high-performance thermoelectric heat pump that cools the refrigerant and transfers the heat into the ambient environment“. Science! 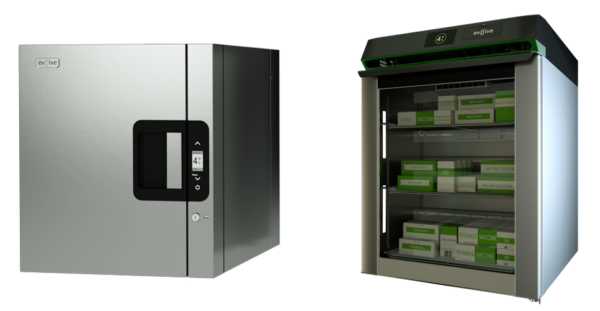 Evolve refrigerators meet CDC vaccine storage guidelines as well as requirements for use in a clean room. In addition, the units provide alerts for temperature, door, battery, memory, loss of WiFi, and loss of power via local and remote monitoring options. Because the refrigerators utilize solid-state technology, the company is able to squeeze more storage capacity into a unit compared to a similar sized non-solid state refrigerator. Up to 25% more storage capacity according to the company. I’m not sure if you’re aware of how much noise refrigerators can add to a pharmacy, but it’s lot. This is especially true in the IV room where PEC’s (hoods) already make the environment less than friendly to one’s ears. Not only does the Evolve line of refrigerators look pretty cool — no pun intended — their ability to reduce noise pollution in the pharmacy is a welcome bonus. * I first wrote about Evolve back in December 2015 after seeing the product at ASHP Midyear. I’m a little slow getting to my thoughts on this deal. A couple of weeks ago it was announced that Talyst had been acquired by Swisslog Healthcare. I’ve known about this acquisition for a while so I wasn’t surprised when it finally went through. Since the announcement, I’ve reached out to some friends and colleagues on both sides of the fence to get their thoughts and opinions on what’s in store for the future. My contacts at Talyst have been quite helpful and informative. Swisslog, not so much. In fact, they’ve provided me with no additional information or insight. All they’ve done is sic their marketing department on me, who in turn sent me a bunch of marketing hype that I can find online. Useless. I hope this isn’t a primer on what we can expect from the “new Talyst” moving forward. That would be unfortunate. I suppose this is the difference between a small company and a large company. I’ve always had trouble getting good information from large companies. There are simply too many layers to get through. With small companies, I can often go directly to the CEO. In large companies, I’m met by an army of people designed to keep people like me away from the CEO. Trying to figure out what Swisslog wants with Talyst has given me much to think about. Talyst is a market leader in certain acute care areas of pharmacy, such as carousels and inventory management software. They aren’t particularly creative or innovative, but rather steady. Talyst knows carousels but that market has kind of run its course unless you’re building a new pharmacy. The high-speed packaging market in acute care pharmacies is basically dead. The company doesn’t offer a competitive controlled-substance management system. They have a solid refrigeration strategy, but it’s not as innovative as something like Evolve. Talyst doesn’t do anything with RFID technology nor do they have a mobile strategy. Their software has good functionality but is antiquated in many ways. So what it is that Swisslog wants? Customer base? Name recognition? Swisslog doesn’t have much of a footprint in acute care pharmacies except for their tube system, which is basically everywhere. However, Swisslog is creative and innovative. They have some robotic systems like BoxPicker, PillPick, and RoboCourier. They make use of RFID technologies. They have pretty decent integration within their systems and they’re really good at logistics. Honestly, I don’t know as much about Swisslog as I do Talyst. In general, I like products from both companies. However, it’s hard for me to imagine where Talyst products will fit into the Swisslog scheme. The items I think Swisslog needs from Talyst will likely be the most difficult to use, i.e. think square peg and round hole. I suppose the existing Talyst customer base is something that Swisslog can take advantage of. Customers using Talyst products could benefit from Swisslog products and better integration across the two platforms. That goes vice versa as well. Only time will tell, but I’m betting that we won’t see anything significant from this deal for quite some time. Timeliness, or lack thereof. “A delay of 2 – 5 years might not matter in some fields (e.g. anthropology or history or statistical methods), but it matters in medicine and science!” You don’t say. Affordability. Anyone that’s every purchased a science or healthcare related textbooks of any kind can attest to this. Some of my pharmacy school textbooks came with staggering price tags. Same thing applies to medical literature/journals. The subscription cost of some journals is criminal. Access. No doubt a huge problem. “I also worry that those who really need my book can never get hold of it.” I find that this is also a huge issue with medical literature/journals. Getting ahold of articles isn’t easy. You can always get the information, as long as you’re willing to cough up the dough. The author is spot on with his assessment. This is especially true in my area of expertise, i.e. pharmacy automation and technology. I’ve read the so-called pharmacy informatics textbooks. They’re out of date and expensive. I regret purchasing both of them. I suppose the big question after reading the piece in Nature Microbiology is how to solve the problem. I don’t have an answer. Going completely digital isn’t the solution, at least not with current technology. Hundreds (thousands?) of hours in front of a computer monitor has convinced me of that. It’s like gazing into a flashlight. Headaches and eyes that feel like sandpaper at the end of the day have led me to re-embrace paper. I know, I know, it feels antiquated to me as well. But I haven’t found a technology yet that completely replaces the ease and utility of using pen and paper for some things; reading literature and taking notes, for example. With that said, there are certain things that publishers can do to speed things up, improve access, and cut cost. The open-source literature movement has taught me that. Universities should also take a more active role in pushing publishers to do the right thing. It never ceases to amaze me when customers refuse to push back. I see this in hospitals with automation and technology vendors. Hospitals will purchase and continue to use technology that they are unhappy with. Why? Something akin to Stockholm Syndrome, perhaps. It will be interesting to see what publishers do moving forward. The current system is stuck in time, and as long as the end-user continues to accept the model, it will continue. Hello, old friend, it’s been a while. I have neglected this weblog. The reasons are not important. I continue to write, explore ideas, and think about technology. However, for the past several months I’ve been using a more traditional method to record my thoughts, i.e. pen and paper. There’s something cathartic about writing in a notebook, and I’ve filled a few. The world of pharmacy technology has, at least in my mind, become a bit stale. I’ve been exploring other technologies that I don’t routinely see in pharmacies, such as artificial intelligence and neural networks, augmented reality, nanotechnology, 3D printing (see some of this in healthcare), autonomous vehicles, and so on. This has allowed me to keep my sanity while continuing to work as a practicing pharmacist. I continue to explore pharmacy topics but in a more philosophical way. I’ve had many long discussions with pharmacists both young and old about the profession, past, present, and future. Some of the discussions have been enlightening and encouraging. Others have been disturbing and gut-wrenching. Overall, the profession is heading in a direction I don’t want to go. I’ve seen and heard things that lead me to believe that the profession as a whole is on life support. If one were to gaze into the future and be truly honest with themselves, they would realize that pharmacy exists out of nostalgia more than necessity. But that’s of no importance here, at this moment. This weblog is a personal space, where I can write about pharmacy and other topics of interest to me. It was never intended to be used for business. I have to remember that. With that said, I think it might be time to revive my digital presence here. I have a lot of things to talk about. Some pharmacy related, some not. Some technology related, some not. Some uplifting, some discouraging. All interesting, at least to me. I’m thinking about a career move that would free up my weekends again. If that happens, perhaps we can even enjoy some Saturday Morning Coffee together. I miss my Saturday Morning Coffee. Calling all students and professionals with an entrepreneurial spirit! Here’s something special happening in the local Fresno area…. Class meets on Wednesday evenings from 5:30 pm to 7:30 pm at the California Health Sciences University (CHSU) in Clovis CA. Participants work in teams, and we will help you join a good team. You will not sit around for long-winded lectures. This course will provide participants with a “hands-on” introduction to leading an entrepreneurial enterprise by building a business model and constructing a prototype product or service. Participants work in teams, and all good ideas are acceptable. Teams will meet once a week to report progress. Teams demonstrate their prototype and business models to people or organization who are potential customers. Teams revise their prototypes and business models based on feedback. The step-by-step “Lean Startup” process is based on the National Institutes of Health (NIH) program to train medical scientists/entrepreneurs. Dr. Charles Douglas at cdouglas@chsu.org or 559.573.8026. The article addresses data collected from a large-scale, retrospective analysis of medication errors identified during the preparation of antineoplastic drugs, aka chemotherapy. The paper looks at 759 060 doses prepared in 10 pharmacy services in five European countries (Austria, Czech Republic, Denmark, Germany, and Switzerland) between July 2011 and October 2015. While the sheer number of CSPs made over that period of time isn’t impressive, the fact that they’re all chemotherapy is. I believe this is the first article of its kind. 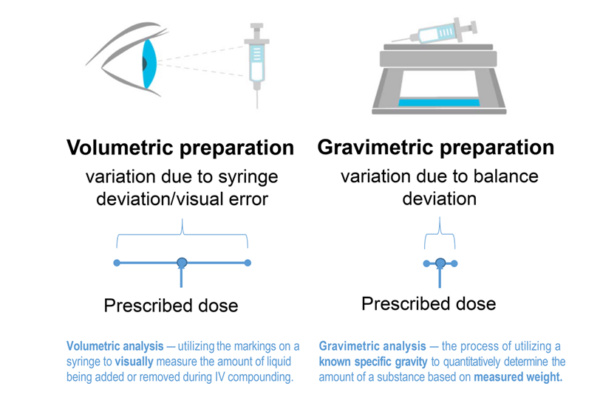 I can’t think of another article that looks at the use of an IV workflow management system across such a large number of facilities, much less the use of gravimetrics during the compounding of sterile hazardous drugs. The authors of the paper do a good job of: (1) addressing the use of gravimetrics versus image-assisted volumetrics, (2) covering the weaknesses of using syringes to measure small volumes (take a look at FIGURE 2 Tolerances of 1- and 5-mL syringes), and presenting a solid case for why gravimetrics is important for preparing hazardous CSPs. It also has some good images and tables, which I plan to refer to in future presentation. In a nutshell “[e]rrors were… identified during weighing stages of preparation of chemotherapy solutions which would not otherwise have been detected by conventional visual inspection“. I find that this is the key benefit of using a system with gravimetrics, i.e. the accuracy of the dose doesn’t rely on human inspection. Overall, the gravimetric system caught errors in 7.89% of the 759 060 antineoplastic doses prepared. This percentage is consistent with other studies looking at CSP error rates. A total of 13 831 errors for doses that deviated by more than 10% were caught by the system. That may not sound like a lot, but it can be, depending on the situation. Worse yet, 4 467 errors were off by 20% or more. Regardless of the situation, a 20% deviation in a dose is unacceptable. The significance, of course, is that a deviation this large could result in unintended toxicity or under treatment, depending on the direction of the error, i.e. 80% – 120% of the prescribed dose. The article concludes that the “Introduction of a gravimetric preparation system for antineoplastic agents detected and prevented dosing errors which would not have been recognized with traditional methods and could have resulted in toxicity or suboptimal therapeutic outcomes for patients undergoing anticancer treatment.” I agree in principle with the sentiment, but believe that the authors overstate the significance of the gravimetric system while understating the importance of secondary checks. By stating that the system “prevented dosing errors which would not have been recognized with traditional methods” they are assuming that all errors would have made it past a pharmacist or other secondary verification method. It’s possible — maybe even likely — that some of the errors would have made their way past a secondary check, but not all. In many cases, chemotherapy preparations go through several step-checks during the compounding process. Typically, one of those step-checks is verifying the dose — volume in the syringe — prior to injecting it into the final container. Errors are often discovered at this point in the process. With that said, the author’s overzealous conclusion shouldn’t take away from the importance of gravimetrics in preparing CSPs. Do yourself a favor and go get a copy of the article. It’s worth a few minutes of your time. A PDF copy can be downloaded here. The system used in all the pharmacies was BD Cato. BD funded the project. While this can raise some red flags, I don’t think it’s enough to disqualify the data. Other companies, like Baxter, sponsor half of the sessions on compounding safety at ASHP Midyear. I for one am happy they do it. Support from companies like BD and Baxter go a long way in bringing important topics like compounding safety to the masses. So, focus on the use of gravimetrics, not on the company that sponsored the paper. I’ve been thinking a lot lately about the right way to go about putting new technology into a pharmacy. Making the decision to add technology doesn’t mean running out and purchasing a million-dollar piece of equipment and shoving it in a corner. It’s much more complicated than that. You must first lay the foundation for the work to be done. Give everyone fair warning of what you plan to do. No one likes to be surprised and people fear change. The best policy is to give people plenty of warning before making a change, which will allow them to get used to the idea. This will go a long way in gaining support for the project. Being aware of what’s coming is always preferable to being surprised by what has already been done. Gauge user beliefs and feeling. It’s best to take the temperature of pharmacy personnel prior to getting started. Is it going to be an uphill battle? Are the pharmacists and technicians open to the idea of implementing new technology? Is the pharmacy morale where it should be? Does your department fear change? The success of the implementation depends heavily on how well the department is warned and prepared for the change. People often see technology as a threat to control over their work environment, resulting in pushback. Helping staff understand what it is you hope to accomplish, how it will help them, and offering opportunities for staff to become vested in the project can go a long way in ensuring a successful implementation. Get support/buy-in for the project. Support for any project is a must. Recruit from the top of the organization to the bottom. Failure to do so may result in a failure to launch. Whenever possible it is best to have support from the highest level of the organization, executive sponsor or someone from the board if you have one. Influence matters. And don’t forget to involve all departments that will be impacted by the change, including nurses and physicians when appropriate. Create a buzz. Create some excitement. Don’t act like the project is required, but rather a choice that’s going to make things better. This is the power of advertising. We fall for it all the time, from cars to smartphones. Involve as many people as possible as often as possible. When people are involved, it gives them a sense of ownership, making them vested in the project’s success. It also helps deal with negative vibes that may come from others. Champions. Champions are the people that go above and beyond the general participant. Champions believe in the technology and the benefits it will provide. They can often have a contagious zeal about the project, and are sometimes referred to as “evangelists”, or in extreme cases “zealots”. Whatever you call them, you need them. When it comes to implementing new technology in the pharmacy, champions can be your best source of support and are often useful in putting a spotlight on the project in a positive way while swaying negative feelings about the project. Finding Champions shouldn’t be too difficult. There are usually early adopters in every group. They will often present themselves while taking the initiative to learn more about the project without being asked. Be willing to commit to handling extra work, even if it means staying late or doing some reading at home in the evenings or on the weekends. I understand that no one wants to put in a bunch of unpaid overtime on these projects. However, on occasion, a little extra work needs may need to be done to keep things moving forward. One should enter into participation with the understanding that this could happen. Be willing be engage in every aspect of the project, not only the items that are assigned. It is vitally important that each participant has at least a basic understanding of the overall scope of the project and what each member of the team is assigned to do. Things happen. People get sick, quit their jobs, move to another state, and so on. Such unforeseen events should not completely derail the project timeline or goals. Sway the naysayers. Every project has its opposition. As the saying goes, you can’t please everyone all the time. Unfortunately, naysayers tend to be the most vocal personalities in any group. They’re not afraid to say what’s on their mind; whether positive or negative. The downside is that outwardly negative comments about a project have a way of spreading like wildfire. They’re caustic and often seep into the minds of even the staunchest supporter without warning. And once planted, negative thoughts grow like a cancer. Naysayers and their negative comments have their place. They often point out things that others fail to see, helping avoid pitfalls along the way. The trick is to use the information to your advantage and allow naysayers to offer their thoughts in an environment that won’t bring down the rest of the pharmacy. Give them space to vent, and then do your best to use the information to flip them. If you can show the naysayers in the group that you’re willing to listen to them and take their concerns seriously, you may be able to get them on your side. That’s a huge victory for any project. On the other hand, never force change on a naysayer. Forcing change or mandating them to join your side rarely works. It’s like dealing with a donkey, the harder you pull, the harder they resist. Build a team with high potential for success. According to Harvard Business Review’s (HBR’s) 10 must Reads On Emotional Intelligence (3), the source of great success lies with teams that can achieve high levels of participation, cooperation, and collaboration among members. Have a sense of group efficiency – belief that the team can perform well and that the group is better than the individual members. Collectively, HBR refers to this as the groups “emotional intelligence” (EI). And while the knowledge and experience among group members is important, EI may be more important still. Keep this in mind when you begin building the project team. Chose a project leader. Being “the leader” is a burden that many well-qualified individuals shy away from. With that said, someone has to be in charge. Someone has to be given authority over the group. Someone has to be willing to make the tough decisions and hold people accountable. Not everyone is cut out to be a leader. I am of the opinion that leaders are born, not made. You either have it or you don’t. I know because I’ve tried many times to lead and failed. It wasn’t for lack of knowledge or desire, but rather a lack of natural leadership and charisma. On the flipside, I’ve been around many people that just have “it”; “it” being a knack for getting people to follow them and do what they say, i.e. they’re natural born leaders. Find a project manager. As ridiculous as this may sound, the project manager is an often overlooked position when discussing project teams. Let me go on record now as saying that a good project manager is absolutely vital to the success of any project; arguably the most vital consideration to the success of a project. It is the job of the project manager to manage all aspects of the project, including the scope, the timeline, the cost, the quality, and the people. They apply their knowledge, skills, tools, and techniques to help projects be successful. The project manager cannot serve two masters. Individuals that serve as a project manager must not be required to do any of the actual work in the project. According to Lewis (4), “as team sizes increase, it becomes impossible to work and manage both[the work and the team], because you are constantly being pulled away from the work by the needs of your team members”. Having project managers attempt to manage the project in addition to working on the project is a recipe for disaster. That’s it. Piece of cake. Go forth and build your implementation team. Vaughan PJ. Internal Report of Information Technology Services. University of Colorado at Boulder. 2000. Hunton, J.E. and Beeler, J.D., Effects of User Participation in Systems Development: A Longitudinal Field Experiment. MIS Quarterly, 21(4), 1997, pp. 359-388. Hbrʼs 10 Must Reads On Emotional Intelligence. 1st ed. Boston (Massachusetts): Harvard Business Review Press, 2015. Print. Summary: if you’re preparing compounded sterile preparations (CSPs) in a pharmacy IV room, you should be using gravimetric analysis to determine the appropriate dose/volume. Pharmacy practice is easy. Our job is to provide the right drug, at the right dose, to the right patient in the safest, most efficient, cost-effective manner possible. Simple. Currently, the only method for ensuring that the correct drug is used during sterile compounding is barcode scanning. The future may hold other methods — I’ve read promising things about real-time solution concentration and drug identification using Raman spectroscopy — but for now, barcode scanning is it. Using either a step-check process or photo-assisted volumetrics is significantly better than the pull-back method, but not without their pitfalls. I’ve seen errors resulting from both methods where the technician pulled the wrong dose and the pharmacist verified it. It is unclear how this happens. It may result from checking bias, simple “slips”, or even laziness on the part of the pharmacist. It’s difficult to know for certain. Gravimetric analysis utilizes the specific gravity of a solution to quantitatively determine the analyte, i.e. the drug found in the solution. In the case of an i.v. preparation, the method can be used to determine the accuracy of a dose drawn into a syringe, removed from a vial, injected into an i.v. bag, and so on. The assumption is that if you know the weight of an object – syringe, i.v. bag, a vial of medication, etc – before and after adding or removing a substance, then you know exactly how much drug was added or removed. Gravimetrics acts as a forcing function, i.e. you can’t continue the compounding process until you have the correct weight. It’s also incredibly accurate. The only thing I’m uncertain about at this moment is how low the weight can be and still be accurate. This is important as small volumes in small syringes can be problematic. Overall, syringes as a measuring device are accurate, but variable. (4) Tolerances for sterile graduated plastic single-use hypodermic syringes are defined by the International Organization for Standardization (ISO), specifically ISO 7886-1. ISO standards vary by syringe size and volume of fluid drawn and expelled. The commonly accepted definition for an accurate disposable syringe below 5 mL nominal capacity is +/-­ 5% when measuring volumes at or above 50% nominal volume. Accuracy increases slightly to +/- 4% when measuring volumes at or above 50% nominal volume for syringes greater than 5mL nominal capacity. There are several semi-automated IV workflow management systems available today. They range from low-end, lightweight systems to high-end, feature robust systems. Pick your poison, as they say. However, I encourage anyone looking for one of these systems to give serious consideration to those that offers a fully integrated scale, i.e. gravimetrics. Doing otherwise could potentially be tragic. Left to right: i.v.SOFT from Omnicell, BD Cato from BD, DoseEdge from Baxter. Image Source: Jerry Fahrni, Pharm.D. The photo can be viewed before or after the drug is shot into the final container, depending on the workflow. Obviously, viewing a photo of a syringe containing drug after the CSP has been made has its limitations. The image does a good job of showing the difference between volumetric and gravimetric preparation. Source: Terkola R, Czejka M, Bérubé J. 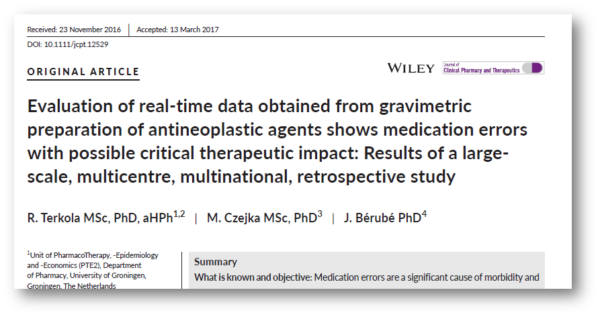 Evaluation of real-time data obtained from gravimetric preparation of antineoplastic agents shows medication errors with possible critical therapeutic impact: Results of a large-scale, multicentre, multinational, retrospective study. Journal of Clinical Pharmacy and Therapeutics. 2017. doi:10.1111/jcpt.12529. I’m of the opinion that state boards of pharmacy should begin fining pharmacies that still use the pull-back method for IV prep. Administrators should be held professionally and personally responsible for allowing the method to continue. It simply shouldn’t be allowed. It’s dangerous, reckless, and lazy. Poppe L, Savage S, Eckel S. Assessment of final product dosing accuracy when using volumetric technique in the preparation of chemotherapy. Journal of Oncology Pharmacy Practice. 2016;22(1):3-9. doi:10.1177/1078155214549489. Each Friday the CompoundingToday Newsletter faithfully appears in my inbox. The newsletter features commentary by Lloyd V. Allen, Jr., Ph.D., RPh, Editor-in-Chief of the International Journal of Pharmaceutical Compounding. Dr. Allen is a legend in the pharmacy compounding world for both sterile and non-sterile products. He was someone that I looked up to during my early years as a pharmacist; still do, as a matter of fact. Long before USP <795> and <797> existed, he was preaching the gospel of proper compounding technique and the need for specialized training. Truly a visionary man ahead of his time. I hope to meet him in person someday. So it should come as no surprise that I take seriously every thought and opinion he has. In last week’s Compounding Newsletter, Allen tackled an interesting topic with some thoughtful commentary. Numerous state boards of pharmacy have concerns about United States Pharmacopeia (USP) Chapter <800> Hazardous Drugs-Handling in Healthcare Settings. – The official chapter goes beyond the walls of the pharmacy and into healthcare settings, including physician offices, clinics, hospitals, treatment centers, etc. where state boards of pharmacy don’t generally have authority for enforcement. – The requirements of <800> are very strict and extremely costly; many smaller pharmacies will no longer be able to serve their patients who depend upon compounded medications so they will simply cease compounding patient-specific medications, including some hospitals. – Many of the requirements of <800> are based upon “opinion” and not necessarily upon science as demonstrated by documented, prospective studies. It’s interesting to note that USP <800> extends into all areas where HD’s may be used, including physician offices. Where will that oversight come from? Will pharmacies be held accountable? Dr. Allen’s zinger about the lack of science is understandable and shared by many, but I don’t believe that prospective studies are always necessary to begin a process. For example, would you really want a 10-year pilot study showing that healthcare workers in the U.S. exposed to HDs are 10 times more likely to die of cancer than those that don’t before implementing these guidelines? (1) No, of course not. As I’ve said many times before, some fields – clean room procedure and pharmacy technology, for example – cannot be studied and scrutinized in the same manner as therapeutics. We simply can’t wait 5-10 years to change operational practices. With that said, USP <800> probably goes too far too fast in certain aspects of the regulation. Only time will tell whether the new guidelines will have the same impact as USP <797> did back when they were introduced. Dr. Allen goes on to state: “As state boards of pharmacy have options other than accepting USP <800> in its entirety… The purpose of this document is to simply provide a resource from which state boards of pharmacy can “pick and choose” items to include for their respective state.” While this may be true, it is one area where I disagree with Allen. Giving each state the ability to “pick and choose” how to implement and use USP <800> makes things incredibly difficult. California, for example, has made a complete mess out of their new regulations. Other states will do the same, creating chaos. In Allen’s scenario, moving ten feet across a state boundary could mean following a completely different set of rules. How does that make sense? I recommend developing USP <800> to a point that everyone can live with and use it. Period. I encourage you to read through the most recent issue of the CompoundingToday Newsletter. I also recommend that you “click subscribe” as well. The information is good and thought-provoking. As my friend and colleague, Ray Vrabel likes to say, the clean room is “clean, but deadly”, referring to the fact that we spend all our money on regulation and virtually nothing on technology to improve safety. Look-alike/sound-alike (LASA) medications – also referred to as sound-alike, look-alike drugs (SALAD) (1) — have been a thorn in the side of healthcare professionals for as long as I’ve been a pharmacist. Many solutions to the LASA problem have been proposed, including Tall Man Lettering (2), physical separation of look-alike drugs, printing of both brand and generic names on packaging and storage bins, use of colorful warning labels, and so on and so forth. The problem with all these solutions is that they involve humans. Working in acute care pharmacy has taught me over and over again that as long as humans are involved there will be errors. Technologies can help. Automated carousel technology and robotics can help manage physical separation of the medications and eliminate visual bias generated by human eyes. Bar-code scanning can certainly aid in identifying medications correctly. Bar-codes don’t care that medications have similar names, they’re either right or wrong. the latter drug has an indication that matches an active documented diagnosis. In the study the authors perform a retrospective analysis to identify errors that involved cyclosporine and cycloserine. The algorithm wasn’t perfect. Sixteen orders involving unique patients were found. Additional chart review of the errors discovered that 5 (31%) identified by the algorithm did not involve a medication error, i.e. the intended medication was correct. However, the algorithm correctly identified 11 (69%) LASA errors. I came out of pharmacy school having learned the phrase “sound-alike, look-alike drugs” (SALAD). At some point it changed to look-alike/sound-alike (LASA). Not sure when, how, or why it changed, but them’s the breaks. Just go with it. Adapt or die, I suppose. I’ve never been a fan of tall-man lettering, and it isn’t even clear that it works to reduce errors. Rash-Foanio, Christine et al. “Automated Detection Of Look-Alike/Sound-Alike Medication Errors”. American Journal of Health-System Pharmacy7 (2017): 521-527. Web. Kondrak, Grzegorz, and Bonnie Dorr. “Automatic Identification Of Confusable Drug Names”. Artificial Intelligence in Medicine1 (2006): 29-42. Web. 28 Apr. 2017. Honestly, one of the simplest things we can do is force providers to select an indication when ordering LASA medications. That simple act has the potential to significantly reduce these errors.